"LOOK at you, you figure jus' because you have a white man you better than me," the Tobago shark and bake vendor told the Trinidadian woman, who had asked for a knife to slit open the bake. Therese Cornelis was mortified and her Belgian husband Andre was shocked at the female vendor's comment. The vendor continued her appraisal of the couple with an all-knowing look. Therese could only jump to one conclusion. "I could read it in her eyes that she was thinking he was too good for me, because he white," Therese recalled. The vendor was about 180 pounds and black. Andre, who had only recently moved to Trinidad was at loss for words to describe the vendor's reaction to Therese's request for a knife to slit the bake to accommodate the shark. "We went earlier to get crab and dumpling by the same women and she was extremely friendly to me but unfriendly to my wife. I was more than shocked when I realised what she was thinking," he said. The couple, who met on the Internet four years ago and tied the knot one year later, has not had many anecdotes to tell of racial problems in this country. In spite of a few racial encounters the Belgium born and bred Andre admires the peaceful and tolerant attitude exuded by Trinidadians and Tobagonians towards each other. He said: "You live so well together and show so much consideration to each other." Andre, however, was quick to point out some underlying currents that he has noticed since moving to the Caribbean. He explained: "Trinis seem to be obsessed with what race there are in Trinidad and Tobago and what exact colour of brown they are and what exact colour of white you are." "I still can't understand this thing about 'red skin'." Andre, 34, said: "One little shade lighter makes you one little shade better in your own society. That is the perception I get of T&T. "Race does not matter to me, I wish it did not to others too. Unfortunately it is a global trend that Trinidad has been caught up in." Therese admitted that she was worried that colour mattered to Andre in the early stages of their relationship. Andre first visited these shores to meet with Therese, whom, he had fallen in love with after chatting with and corresponding on the Internet. Therese said: "I wondered if being black would make a difference. Him being white made no difference to me. I have dated men of all colours including a German guy who was Caucasian. This happened while I was studying for my Masters in Vancouver, Canada." Andre had never dated a black woman before Therese so she believed he had no expectations of how "we would treat him, but I had some expectations of him". By the time of his first visit to Trinidad, Therese was sending e-mail and talking to Andre's brother and parents on a daily basis, while still thinking "do they really know I'm black"? Two days before his arrival Andre saw his first coloured picture of Therese. "I was more even more in love," he openly confessed. The couple agreed that colour made no difference to their relationship once they realised that they wanted to be together. What caused most of the problems for the couple was Therese's parents and that did not last very long. All doubts disappeared as Andre asked for Therese's hand in marriage. "My mother was more worried about who he was and how little we knew about Andre. It was a little scary for me at first as I wondered how much I really knew about him. After all people lie all the time." "My brother used to kid me that he was an old man of 60 with a wife and kids who was going to capture and take me away with him," Therese remembered. Andre pointed out it was the opposite for him: "I thought it interesting that you first get to know the person behind the computer without knowing what they looked liked. So colour never matters. You like the person before the picture." 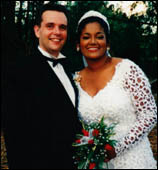 Since the couple's marriage they have lived in Belgium and Trinidad. Therese pointed out that it was harder for her being black and living in that country than her husband living here. She explained: "We lived in Belgium for 17 months. The culture is less tolerant of blacks than we are of whites. I had endless problems finding a job and had to deal with racism." The 33-year-old Trinidadian recalled a number of international companies rejecting her on the basis of her colour claiming she would not "fit in with the culture or was not the right image they were looking for". The companies cannot be named for legal reasons. She said her in-laws never once made her feel like an outsider while she was living in Belgium. Therese actually boasted of the closeness between her and her mother-in-law. For Therese, family would turn out to be the least of her worries. "The language barrier and culture was a big thing for me and his family was full of support but it is hard being a black well qualified woman in Belgium. You are expected to start at the very bottom. I paid my dues and could not do it again." Therese heard every excuse in the book and it all boiled down to her colour. For Andre , Trinidad has been the exact opposite and full of opportunities. The couple recently started their own e-business company, Cornelis & Associates, and boasts the Trinidad and Tobago Olympic Committee and Trinidad and Tobago Rugby Union among their first major clients. But that did not come without its racial considerations. The couple openly admitted that Andre's ethnic and European heritage has been quite beneficial for the business. Although were are equally qualified we decided in the eyes of the public it would be better for him to be the managing director," Therese added: "The colonialism has not died off when it comes to dealing with foreigners. We still believe that foreign is better. In this case not just foreign but European too! That coupled with the whole image of doing business with a woman was the best move." They admitted that to a lesser degree Andre's ethnicity has helped in the image of the company. "Being female and young has not helped my career and that is why I left the bank." Therese gave up her banking career on Valentine's Day this year at one of this country's largest financial institutions. The information technology specialist also pointed out other ways in which her husband's skin colour has been more positive for him. "We get a better quality of service wherever we go. It is amazing how the level of service rises to a new level when Andre is around," she said. "One day I went into a local fast food chain in St James. I remembered asking one of the girls behind the counter if the special was still on. She ignored me and Andre walked in. The girl who was Indian jumped up immediately to serve him." Therese continued: "We looked at each other and Andre said yes you can serve me by serving my wife first." "She looked at me and said, 'Ah did not hear you'." "It is typical colonialism attitude we have in Trinidad and Tobago. We jump when the white man barks," Therese said. But being white doesn't always prove to be rewarding Andre pointed out: "When I go to buy something selling cheap, I can guarantee that the price will be higher for me." He said this was especially true when buying house, land or getting things built for his home. "The fact that I'm white automatically inflates the price compared to the price my wife gets," he said.